Absurd. Perplexing. Wacky. Unexpected. Delightful. 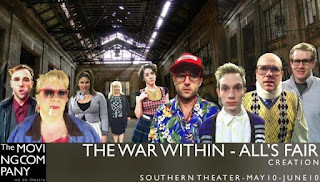 Those are the five words I would use to describe The Moving Company's new piece The War Within / All's Fair (a recent challenge on their Facebook page). I never quite know what to expect when I go to see a Moving Company show, and that's what I like best about them. It's always inventive and creative, a new perspective on a familiar topic. 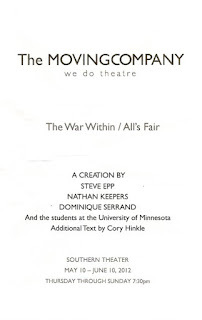 And there's no exception here in this piece created by Moving Company's co-Artistic Directors Steve Epp and Dominique Serrand, along with Artistic Associate Nathan Keepers and some lucky students at the U of M.
How can I describe The War Within / All's Fair? 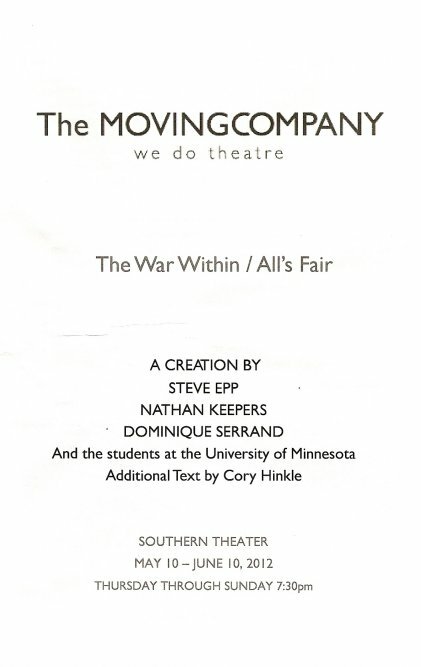 I think this quote from the playbill says it best: "If you're looking for a play here you won't find it. There is no overriding agenda, rather a parade of unfortunate encounters in a fictional workplace. The daily circus of the socially, economically and politically marginalized. Bits and pieces strung together, you might say, to create a more horrifying whole. Inspired by the great tradition of the buffoon, it is a world peopled by characters with little-to-no respect for anything or anyone, and even less for themselves." From the moment the show starts you know you're in for something unique - each character makes their entrance walking across the stage, staring at the audience, finally striking some odd character-specific pose. They move around this unnamed workplace/factory/warehouse in choreographed chaos. The show is loosely structured as random scenes and interchanges between various groups of characters as they go about a day on the job. The most consistent characters leading us through are chameleon Nathan Keeper's janitor, going about his daily tasks of sweeping, vacuuming, and complaining, and the hilarious Susan Warmanen's gum-chewing, pink-wearing gossip (every workplace has one), speaking in nonsensical metaphors. 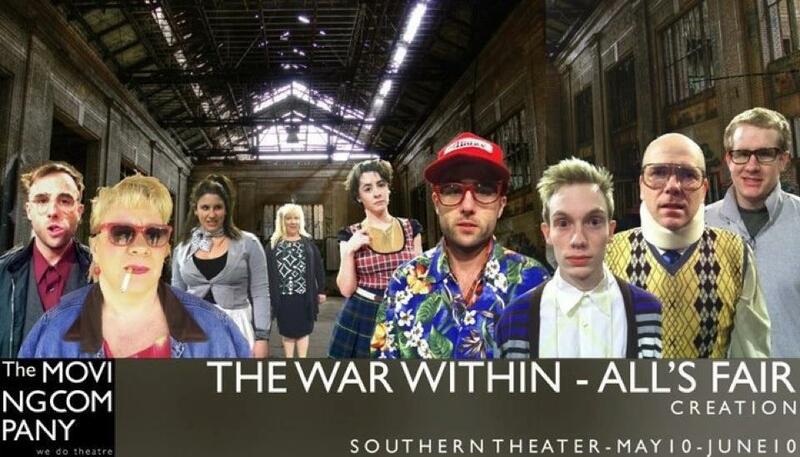 Other characters include Jon Ferguson as the jerk of a boss with a neck brace, Haley Carneol as the self-described pansexual, Christian Bardin as the awkward girl with a lisp, Sam Kruger as new employee Gaush (that's pronounced Josh, not gowsh), whose lifeless body is quite brilliantly and gracefully maneuvered by Peter Lincoln Rusk, when he's not making odd sound effects. Each of these characters is a distinctly wacky creation. And they occasionally break out into song!